My mother's story is widely available on the internet and always has been since I placed it there. [http://gent.org.uk/italy/index.html] It is a simple, brief account, written, as I pointed out in my introduction, to inform my nieces, her granddaughters, as to the Jewish origins of my mother's family. It was never intended for a wider audience, but I decided to make it available, having already discovered how valuable was the internet in making it possible to make connections and discover links. I never thought my own mother's experiences were exceptional, but certainly they were interesting and individual. Thanks to the internet it was discovered by a Croatian author who was sufficiently inspired by it to create a 'documentary novel' that has outgrown its original, tiny, Croatian public to be translated into many languages and has reached a worldwide audience. I am not aware of other, similar first-hand accounts, but my mother's story was discovered, via the internet, by others, including Lucia Vincenti of the University of Palermo, who interviewed my mother during a brief visit to Sicily, and she made use of my mother's experiences in her books, such as 'Donne Ebree in Sicilia durante il Fascismo', on the back cover of which is a photograph of my mother taken at the end of the war when she was sixteen, and her book 'Storia degli Ebrei a Palermo durante il Fascismo'. My mother's story was also used, with permission, in the book 'War's Long Shadow', consisting of extracts of letters, diaries and other testimonies of many people who lived through the Second World War. All these books, of course, unlike 'Trieste', gave due, appropriate and courteous credit to my mother and to her brief account of her wartime experiences. It was not just my mother's experience of anti-Jewish race laws and persecution that drew interest from others. There was also her account of life in Albania for the occupying Italian expatriate community in the period from 1939 to 1943, the time of the Italian surrender to the Allies. It seems that my publication of this account was possibly the first time that such experiences had been recorded and publicised, and led consequently to my being contacted by an Italian researcher, and also by an Italian who had shared those experiences in Albania seventy years ago, and both of those people spoke to my mother. The role of Italian Fascism in the Holocaust, together with the role of Fascist Italy as the invader of countries such as Albania, as well as Greece and Ethiopia, were themes that were shrouded in silence in the post-war years, associated as they were with a time when Italy was led astray by Mussolini and his ideas. My reactions to the publication of the book 'Trieste', despite my initial shock, we're mostly good. I was indeed shocked, traumatised even to the point of bursting into tears as I opened the volume and saw my own family tree, with the names of my own ancestors. However, I was flattered. That an author had been inspired to take that simple story and use it as the vehicle for her own creation felt good. As I turned the first one hundred and twenty pages and found on almost every page a direct quote from the modest booklet produced by myself with my mother I was touched by its amplification and the effectiveness with which the narrative thread was made more satisfying. When my mother wrote her account in response to my many promptings I was delighted, though I remember my father's slight disappointment that it wasn't longer, that it was so elliptical, but my mother of course is not a professional writer or academic, she was and is an elderly housewife who, because of the Second World War, was mostly deprived of the education she merited and deserved. In addition, she was recording her memories and impressions through the eyes of an adolescent girl: she was twelve when she fled with her family from Sicily to Albania, fifteen when she fled again, from Albania to Gorizia, seventeen when, in Milan, she met my soldier father, and the same year became a bride and mother. There were no accounts of the experiences of Italian Jews during the Second World War available in Italian or English until twenty years ago. As for the Italian occupation of Albania there is probably next to nothing available even now. What of the book 'Trieste' by Dasa Drndic itself? First of all I am a historian and not a novelist. I have written and published some books and articles whilst working in my own career. When I read a book like 'Trieste' I read it with my own viewpoint, attitudes and prejudices. Of course I found the first third, based on my mother's story, the most enjoyable and the most interesting. It is human, it is personal, it is to me, and no doubt to many readers, the easiest section to read. After that the book becomes hard work: it feels like a cut and paste job from archive material: great chunks of Nuremburg War Trials proceedings, the enormously long list of nine thousand Italian victims of the Holocaust. This felt like lazy writing, and lacked historical perspective. 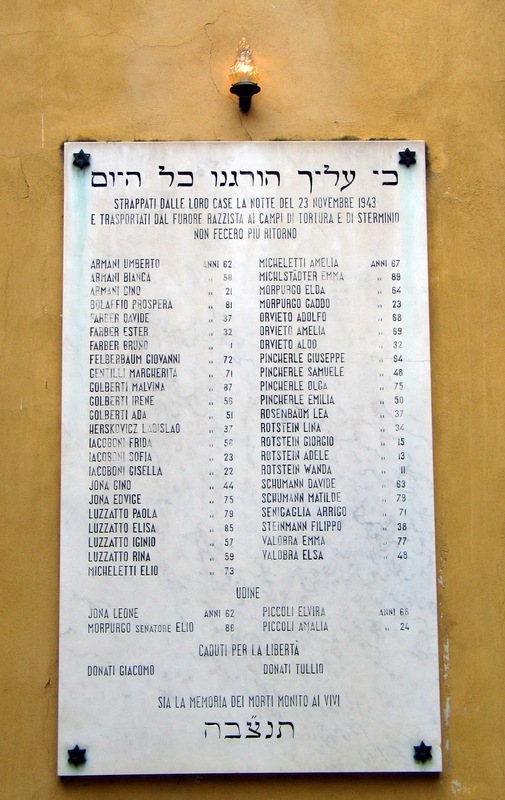 For example, the list of names does not explain that it includes many Jews who came to Italy as a place of refuge to escape Nazi persecution; it does not explain that Jews from Italy were executed after the Italian surrender in 1943, rounded up by the German forces who took charge after that surrender. The book also shows a lack of understanding and empathy for the Jews of Italy in the period from the Unification to the Race Laws of 1938. There is no awareness of books like Alexander Stille's 'Benevolence and Betrayal'. This is not a book written by somebody with a good understanding of the Holocaust in Italy, what happened, and why. Drndic makes a particular accusation in an interview that my mother's 'pathetic, melodramatic and self-pitying' story is written without any reference to the framework of what was happening. Drndic does not understand that when my mother was living in Gorizia in 1943 and 1944, she, like others, was utterly unaware that people like herself were being rounded up and sent to their deaths. Indeed she didn't know this till I went myself to the railway station in Gorizia ten years ago and discovered the new memorial to those deported and I told her about it. How could she know? Nobody knew. There were no books to discover this information, there were no memorials, there were no people to ask or tell. In the same interview Drndic refers to Gorizia representing an overlapping territory for Italians, Slovenians and - astonishingly - Croatians, thus displaying her ignorance. In her notes at the end of the book the author gives carefully and detailed credits for every quote, every reference, every poem and every testimony. She apologises in advance if she has made any omissions, and promises to correct them in future editions. It is curious that this should be so, when she has so studiously omitted any reference whatsoever to my and my mother's small contribution. This omission was corrected at my insistence in the paperback edition of the English version, and now in the Italian version. I made this insistence when the book was first mentioned in the Italian media two years ago, and the story was recognised by a distant relation who telephoned my mother and said he was surprised that the book said that she had an illegitimate child by a senior SS officer. At the same time my mother was hurt by the purloining of her own story and its use in this way, and my sister took up protective cudgels on her behalf and in a brief Amazon review said more or less that the book plagiarised my mother's story. Actually it does, though I have always chosen to minimise this. In a university context this would certainly be considered plagiarisation; at the least it is a gross discourtesy to use personal material so closely and undisguisedly without due mention. I can only think that the author never thought that her book would reach an audience outside its tiny native Croatian audience. So here we are: a naughty omission of a credit is now defended by rude attacks by Dasa Drndic on the quality of the writing in the original booklet, by the accusation that it lacks perspective and context, attributes that were never part of its remit. The author in fact strongly defended and justified what she had done. I accept that Dasa Drndic may be a reasonable writer, though not a great writer, definitely not a Sebald - I have recently finished reading 'Austerlitz' - and even a great writer can be a flawed human being, such as T S Eliot (whom she quotes) and Ezra Pound. I am saddened that she takes advantage of her status to attack the author of a major source and inspiration for her work, using insulting and pejorative language publicly. I take some comfort as I wander today around the many bookshops in Trieste to see that her book does not appear to have caused a big stir. This is not a Trieste story. This is an opportunistic cobbling together of several strands by a writer of some skill, but lacking historical accuracy, context and courtesy. One of the allegedly main villains of this book - though a minor villain compared with Haya's SS lover - is Don Carlo Baubela, the parish priest in Gorizia at the church of San Rocco who is described as stealing the baby to be handed over to the Lebensborn project. This is a terrible slander on a good man, a decent, elderly parish priest and minor scholar who married my grandparents and baptised my mother. He is unable to defend his reputation, and of course has no descendants to do the same. His name was taken from my booklet. Nowhere does this book say that the names and events are fictional, and indeed they are not. This is dangerous and unfair to those living and dead. A book which is based on authentic material and which has the semblance of fact is acting dangerously. If living people like myself and my mother are affected then there is all the more reason to act circumspectly and responsibly. Mons. Dott. Carlo de Baubela parroco di S. Rocco a Gorizia. Spirava santamente in Gorizia negli ultimi di dicembre. Di agiata famiglia, egli si valse delle ricchezze per dar vita a molte opere buone che illustrano la sua vita sacerdotale e a beneficare i poveri che sul letto di morte raccomandava alla ottima sorella. Fu il fondatore del Convitto di S. Luigi che nel 1895 passò ai Salesiani, dei quali egli fu fervido ammiratore e insigne benefattore. It feels especially hurtful that this book is written by a Croatian, and I wonder why Dasa Drndic did not choose to write a similar book based on the terrible Croatian Holocaust. There are similar materials existing for what happened in Croatia. In Croatia there was no need for the Germans to take over, as happened in Italy in 1943, for the persecution of Jews to reach its murderous end. In Croatia the Ustashe government needed no prompting or encouragement to persecute and murder its Jews and other minorities. In Croatia there has been no confrontation with its wicked past as there has been, to their credit, in Italy and Germany. Croatia is akin to Austria, and the Communist counties of Eastern Europe, in this respect. My mother's story is recorded on one website adjacent to the testimony of 'N. ', who was held on the Croatian island of Rab in a concentration camp for Jews, but who fortuitously escaped thence to Israel with her mother and sister. Now that has the making of a good book! Similarly there was the treatment of the Italian-speaking populations of Croatia who were persecuted and ethnically cleansed by the Jugoslavs after 1945. That too is worthy of record. In fairness, this year Dasa Drndic has begun to address some of these issues, referring to the failure to confront the past in Austria and the Balkans. She takes pride in her uncle and father’s roles as partisans in Istria. I wonder how she feels about recent Croatian half-hearted attempts to deal with its shameful wartime past. So, the book is read, my mother obtains a minor recognition, but elsewhere she is insulted by this author. In interviews she criticises Haya Tedeschi, based on my mother, for being a bystander, for allowing her love to cloud her judgement. The truth is that my mother was of necessity a bystander. How unfair of Dasa Drndic to accuse people like my mother, just sixteen years old at that time, of failure to act responsibly, of insensitivity, of being a bystander, of writing melodramatically. How wonderful that my mother’s small memoir inspired a writer in Croatia to produce a volume that has been translated into many languages and will hopefully inform and influence people for the better. I found this review by Erica Wagner. She too seems to think that it was a choice for people in Europe in WWII to turn a blind eye to what was happening... In fairness, on another point, the reviewer was unaware that the author was forced to give a small acknowledgement to my mother.